Biography of Greek Sculptor, High Classical Sculpture. see: Venus de Milo (c.130-100 BCE). The ancient Greek architect and sculptor Callimachus was active during the High Classical Period of Greek sculpture. According to a later account of Pausanias, although Callimachus was not one of the greatest sculptors of his era like Polykleitos (5th century BCE), Myron (480-444) or Phidias (488-431), he was considered to be an exceptionally clever and innovative artist. It is also said that he was nicknamed "catatexitechnus" - often simply translated as "the perfectionist" although a better rendering is " one who spoils his art by over-elaboration". Little is known of Callimachus' origins, early life or how he learned the art of sculpture. He is recorded as an architect and sculptor in the late 5th-century BCE, according to the tradition set by Polykleitos. Sculptures from both Corinth and Athens are attributed to him, making it likely that he was born in one of these cities. His sculpting ability is not known from any surviving originals or in any certain copies, but references to his works in ancient writings has led to a number of sculptures being attributed to him. To begin with he is credited with the Nikes on the frieze of the Temple of Athena Nike on the Athens Acropolis. Pliny the Elder (23-79 CE) refers to his Lacedemonian dancers and a statue of the seated Hera made for the Heraion of Plataea. In addition, six Maenads (ecstatic females possessed by a divine spirit) attributed to him exist in Roman copies. 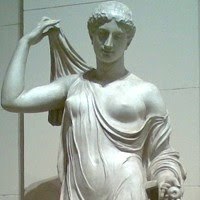 The close-fitting drapery featured in these Maenads has led to other works being credited to him. To learn how to judge classical Greek sculptors like Callimachus, see: How to Appreciate Sculpture. For later works, please see: How to Appreciate Modern Sculpture. What characterises Callimachus more than anything else is his painstaking attention to detail, hence the soubriquet "catatexitechnus". Reportedly, he was the first to use a drill for shaping marble sculpture, and to enhance the effects of light and shade in the hair, foliage and other features of his sculpture, and to assist in the fine detail he sought. Knowledgable about the history of sculpture in ancient Greece, he modelled his work on the tradition of the old masters and pioneered the Archaic style. Callimachus also has a place in the history of architecture. He is considered the inventor of the Corinthian capital, the third of the classical orders of Greek architecture. According to a story recounted by the Roman architect Vitruvius (c.78-10 BCE), Callimachus got the idea while looking at the acanthus blossom wrapped around a basket which had been placed on a child's tomb. Since the first known Corinthian capital dates from around 425 BCE, when Callimachus was most active, the story could easily be true.  For the development of Greek sculpture, see: Homepage.